It never takes long for an India-Pakistan fracas to dissolve into a farce. The unintended fun has arisen from the Bharatiya Janata Party government not giving up on the “surgical strike” issue to wring every last drop of political capital out of it. Except, the claim of this retaliatory action of being generically different from previous such cross-LoC actions by Special Forces (SF) has now been officially hollowed out by Foreign Secretary K. Jaishankar, who merely repeated the statement by his predecessor Shivshankar Menon that the only difference was that the Narendta Modi government to make it public but added mysteriously that going public was in order to unveil a new “strategy”. What strategy? The one of carrying out “limited-calibre, target-specific, counter-terrorist operations”. OK. But publicly owning up to an anti-terrorist operation is no bad thing if a really major aim was achieved. But when the goal itself was pretty minor — of destroying some LeT/JeM staging camps and killing anybody getting in the way, as the FS’ explanation itself suggests, it is hard to transform it into a military spectacular without the whole episode turning into one generating mirth. All a retired, much respected paratrooper general who visited me the day before yesterday could do when asked about the unfolding comedy was to make embarrassed noises. He couldn’t make head or tail of it anymore than anyone has been able to. Something so obvious should have been kept in mind when the Modi regime chose to announce it to the world. So, a bit of chest-thumping doesn’t hurt. But it is precisely this He Man-activity the PM had asked his BJP colleagues to refrain from. As if to further roil the issue, defence minister Manohar Parrikar attributed the decisiveness shown by Modi and himself in ordering SF retribution for the Sept 28 terrorist attack on Uri to a mindset firmed up during their time in the RSS (Rashtriya Swayamsevak Sangh). Not to be contained, Modi, on the basis, of this SF action compared India to Israel. A more inapt comparison is hard to conceive. The actions would have been comparable had the Indian reaction been more in the Ram Madhav-articulated mould of “jaw for a tooth”. Actually, the Israeli retaliatory principle is rearranging the skull for a slap — which metric doesn’t fit any Indian military action to-date (other than 1971 war to liberate Bangladesh). At a practical level, Israeli retaliation believes in methodically eliminating the leadership — if hydra-headed, a head at a time. It is something the Israeli Intelligence is geared for, because it seeks realtime information about the evolving Hezbollah or militant Palestinian leadership race. No sooner a controlling head surfaces, it is chopped off in response to usually small Palestinian provocation. Whole Arab villages are bombed for a katyusha rocket attack. This is simply not the sort of counter-insurgency, anti-terrorist wars, or even hard-hitting conventional military conflicts, the Indian Army is either prepared for or ordered to fight. This entry was posted in Asian geopolitics, Bangladesh, civil-military relations, domestic politics, Geopolitics, Great Power imperatives, guerilla warfare, India's Pakistan Policy, India's strategic thinking and policy, Indian Army, indian policy -- Israel, indian policy -- Israel, Iran and West Asia, Internal Security, Israel, Pakistan, Pakistan military, society, South Asia, Special Forces, Terrorism. Bookmark the permalink. Interesting, because from what a lot of retired servicemen and analysts said, this raid was different. Previously we may have crossed over and brought a head or two from Pak Army, but in this case most sources said it was a slightly deeper strike on militant launchpads. Anyhow, if this raid is nothing new or special, then what do you suggest we should have done/or should be doing? What would be a good response to an Uri style attack or a 26/11 style attack according to you, Dr. Karnad? request you to kindly remove my article on China -india comparison. I am not critical of any policy. we should eliminate mazood azhar and co at the earliest to create panic in ISI. Dear Sir, Please let us know in case of earlier terrorist attack what was tactical and strategic response given by India ever?? ” 26/11 rss ki saazish” from congress government. At that time what was Mr Shivshankar Menon doing? First time the Indian government gives a strategic response to terrorism through a tactical surgical strike and is accountable for it. Whenever there is change,challenge to existing mind set,there’s a reaction. Former home minister P Chidamberam stopped TADA law, which caused security vulnerability and direct threats to Indian civil society just to satisfy the Congress government’s vote=bank politics. Why should BJP stop chest-thumping after doing soemthing good for a change? anonymous@ — The problem is what you mentioned — The Modi govt “gives a strategic response to terrorism through a tactical surgical strike”. It was a TACTICAL response! India had Mig 21 production line. After 1971 pakistan immediately bought 150 F7s from china.The chinese made numerous improvements (khruschev didnt handover all documents.The chinese created hundreds of the design documents which werent supplied. They reduced the landing speed and tried variants and exported it to many countries.What we did? We closed the production line! without doing anything. Rocket artillery: They are exporting. Ours?Recent open literature suggests the rockets are considered not much safe for operation and search for the smerch2 is underway. i have compared only russian wares to which both china and india had enough access. Now they are in the process of developing commercial airliners! 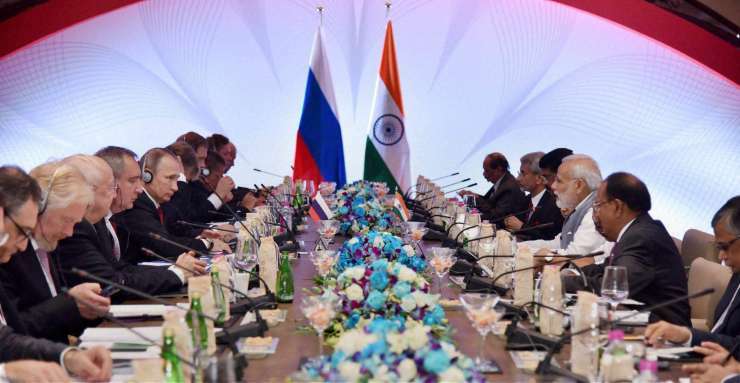 We are in the process of dilemma whether to consider the offer to produce Russian planes in India. Now the question arises. what made china a superior power vis-a-vis india? Education and skillset are strange enough that they cannot be copied by any fool overnight.We need to have some thing in our head. We surely lack in R&D.It will threaten our economic survival in the long run through HIGHER DEFENCE items and other commercial imports. MAKE IN INDIA ( for getting technology. anyway we wont get!) for Indian consumption. CHINESE: HIGH QUALITY AND QUANTITY RESERVES.In the process of internationalising the yuan. OURS: BORROWED AND VULNERABLE dependent on remittances! and hotmoney (stock market flows! )no meaningful FDI.In the process of attracting USD! OURS: WE MOSTLY REPORT OUR SERVERS WERE COMPROMISED BY CHINA! INDIA: HIGHLY RELIABLE BUT ON THE WAY! NB:On one comparison INDIA has a very high growth rate over CHINA and (you correctly guessed it! POPULATION.Alas CHINA recently abandoned its 1 or 2 child policy and here also in the future severe competition.Hence we cant compete with china with our policies!(lol). Hence what we can do is credible DEFENCE (you correctly read it. not OFFENCE! ).Spend high on R&D,improve education, economic power of the country and technical abilities.Else i think we will go NOWHERE! He heh @raja bhaiya ab to goli nikal gayi. Now nothing much can be done about your post. It is now a public record. But it is nothing to be defensive about. You are in an informal blog, not negotiating for the future of India. The reality is that India may win or the Chinese may win, that is for the future to decide. But one thing is for sure the chinese always come with their homework well done. While people from our side can only co-opt I&B ministry to rally the internal opinion and that is it. If you observe the formal behaviour of the Chinese delegation, you will find only the alfa male speaks and always with a coterie which is there only to psyche the other side by constantly bringing their gaze to the moment of action of the other side. This particular weakness is there with all the world where the delegates look like a haggard lot who were just waiting for the opportunity to sit relaxed. Then all of the delegation comes with the plastic smile. And their current alfa male is a master of this plastic smile. As if to say – do whatever you want, I will take all. I will take all because there is no meaning to all this except winning for ones country. And this plastic smile is everywhere – guard of honors, photo-ops, airport protocol receptions, even on negotiating tables. So long as the cameras are there this is distinctly noticable. I don’t know what they do in-camera. The problem from our side is that the alfa male from our side is always too human. You can find so many different faces of Modi ji, it would put a Nava rasa dancer to shame. 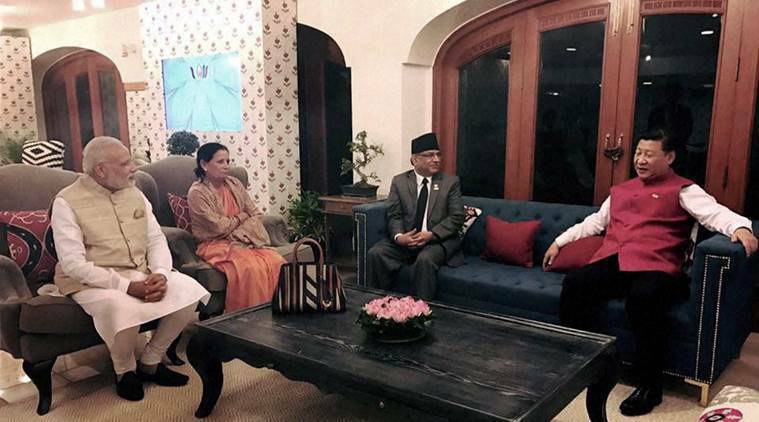 And its not just Modi from our side, the whole team is like that – always oscillating between relaxation-exertion on the negotiating table. There simply is no appreciation for dhairya/patience. 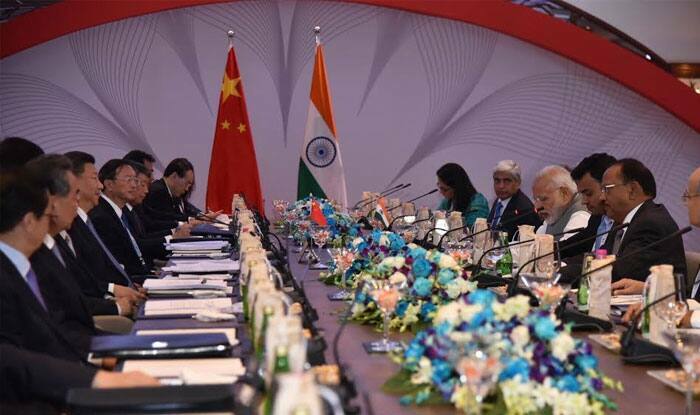 Here is a comparative picture from BRICS 2016 Goa Summit. Which side has come determined to be in control and which side wants to go home the fastest. Our own people are not convinced that the need to fight for the country is a natural and ceaseless one. They come treating it as a part of some smart propaganda exercise to fool their own people. One of the pink papers in which i used to comment on articles, i observed that they use my id to publish their own comments (particularly for caustic comments). Since then i stopped. This blog is a special one.Here the interacting people are well connected to the higher echelons of the state.Even the mecca of democracy (so calls itself!) profiles its citizens on par with FSU,EG. I sincerely put my views for my countrys good but if it leads to unintended consequences for me, that was my fear. (The time it was reblogged surprised me. it seems no activity on the surface but it is highly monitored).Your reply gives me a lot of comfort. See this is how India is being fooled. 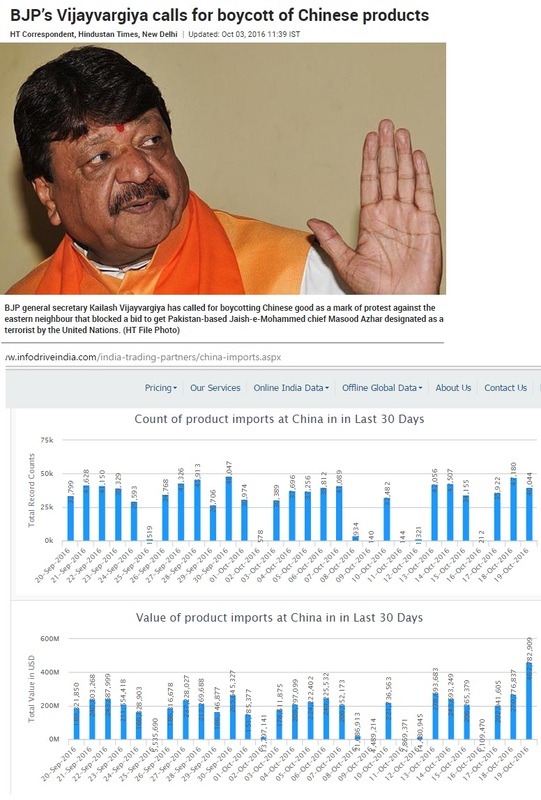 The whole call to Boycott Chinese Goods was made by known chela-chapatas on tweeter egged on by BJP leaders. Even the Main Stream Media cried itself hoarse saying the boycott was hugely successful without showing any evidence. Now that the call has failed, they establishment and Main Stream Media want to wash their hands off it all by blaming ‘private individuals’ for supposed hyper-activism. Meantime China, which has thoroughly studied capability of Indian establishment to respond and understand things, is sitting tight, knowing fully well that large parts of real Indian economy work only because of these cheaper Chinese imported goods. Chinese already know well that our establishment across several elections and parties have destroyed our own manufacturing industry for good. But you will not find one Chela of Modi on the main stream or even the social media, acknowledging this farce.